I loved this luscious Pinot on two different occasions when vintners Doug and Sabrina Kruse were pouring it. It offers a delicious array of ripe blackberries and black cherry balanced by bright notes of raspberry and cranberry, highlighted with minerals and spice. Beautifully balanced, it’s a great choice for grilled red meats, roast rack of lamb or prime rib; of course, it’s also irresistible on its own. 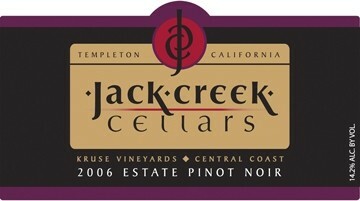 A wine this fine won’t last long so visit www.jackcreekcellars.com, or their tasting bar, Jack Creek Cellars at Pasolivo, 8530 Vineyard Dr., open Fri. – Sun. At $32 retail, it’s a very good value for Pinot Noir of this quality.